Definition at line 36 of file PoolMalloc.h. Definition at line 92 of file PoolMalloc.cc. Definition at line 96 of file PoolMalloc.cc. References assert, clean(), Mem::Meter::currentLevel(), MemPoolMeter::inuse, and MemImplementingAllocator::meter. Definition at line 197 of file Pool.cc. Definition at line 23 of file PoolMalloc.cc. References MemPoolMeter::alloc, MemAllocator::doZero, freelist, MemPoolMeter::idle, MemPoolMeter::inuse, MemImplementingAllocator::meter, NULL, MemImplementingAllocator::obj_size, MemImplementingAllocator::saved_calls, xcalloc, and xmalloc. Definition at line 109 of file PoolMalloc.cc. References MemPoolMeter::alloc, freelist, MemPoolMeter::idle, MemImplementingAllocator::meter, and xfree. Definition at line 45 of file PoolMalloc.cc. References MemPoolMeter::alloc, MemAllocator::doZero, freelist, MemPoolMeter::idle, MemPoolMeter::inuse, MemImplementingAllocator::meter, MemImplementingAllocator::obj_size, and xfree. Definition at line 141 of file Pool.cc. Referenced by MemPoolChunked::clean(), and MemPoolChunked::~MemPoolChunked(). Definition at line 206 of file Pool.cc. References assert, MemPools::GetInstance(), MemPools::mem_idle_limit, NULL, and VALGRIND_CHECK_MEM_IS_ADDRESSABLE. Definition at line 87 of file PoolMalloc.cc. References Mem::Meter::currentLevel(), MemPoolMeter::inuse, and MemImplementingAllocator::meter. Definition at line 349 of file Pool.cc. Definition at line 355 of file Pool.cc. stats Object to be filled with statistical data about pool. Number of objects in use, ie. allocated. Definition at line 61 of file PoolMalloc.cc. 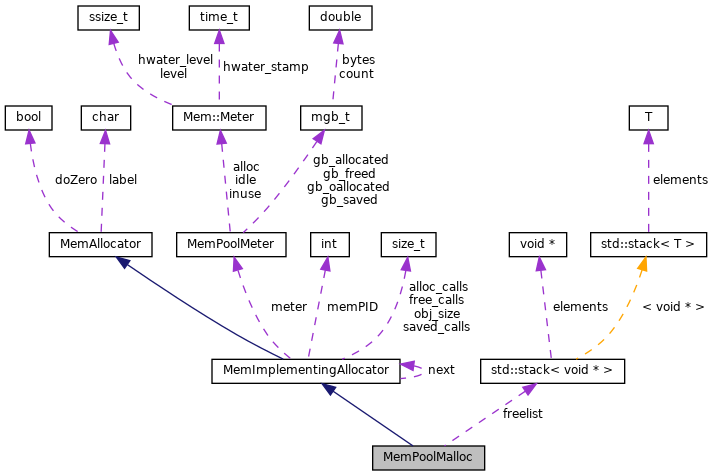 References MemPoolMeter::alloc, MemPoolStats::chunk_capacity, MemPoolStats::chunks_alloc, MemPoolStats::chunks_free, MemPoolStats::chunks_inuse, MemPoolStats::chunks_partial, Mem::Meter::currentLevel(), MemPoolMeter::idle, MemPoolMeter::inuse, MemPoolStats::items_alloc, MemPoolStats::items_idle, MemPoolStats::items_inuse, MemPoolStats::label, MemPoolMalloc(), MemImplementingAllocator::meter, MemPoolStats::meter, MemImplementingAllocator::obj_size, MemPoolStats::obj_size, MemAllocator::objectType(), MemPoolStats::overhead, and MemPoolStats::pool. Definition at line 103 of file PoolMalloc.cc. Definition at line 113 of file Pool.cc. Referenced by Mem::AllocatorProxy::inUseCount(), memInUse(), and memStringCount(). Definition at line 361 of file Pool.cc. Definition at line 107 of file Pool.cc. Referenced by cbdataDump(), MemPoolChunked::getStats(), and getStats(). minSize Minimum size needed to be allocated. Definition at line 293 of file Pool.cc. Allows you tune chunk size of pooling. Objects are allocated in chunks instead of individually. This conserves memory, reduces fragmentation. Because of that memory can be freed also only in chunks. Therefore there is tradeoff between memory conservation due to chunking and free memory fragmentation. As a general guideline, increase chunk size only for pools that keep very many items for relatively long time. Definition at line 218 of file Pool.h. Referenced by createRemovalPolicy_lru(), and Mem::Init(). Definition at line 205 of file Pool.h. Referenced by Mem::AllocatorProxy::getAllocator(), GetStrPool(), memDataInit(), and Mem::AllocatorProxy::zeroBlocks(). Definition at line 272 of file Pool.h. Whether to zero memory on initial allocation and on return to the pool. We do this on some pools because many object constructors are/were incomplete and we are afraid some code may use the object after free. These probems are becoming less common, so when possible set this to false. Definition at line 233 of file Pool.h. Referenced by allocate(), deallocate(), MemChunk::MemChunk(), and MemPoolChunked::push(). Definition at line 273 of file Pool.h. Definition at line 55 of file PoolMalloc.h. Referenced by allocate(), clean(), deallocate(), and idleTrigger(). Definition at line 268 of file Pool.h. Definition at line 267 of file Pool.h. Referenced by MemPoolChunked::allocate(), allocate(), clean(), MemPoolChunked::deallocate(), deallocate(), MemPoolChunked::getInUseCount(), getInUseCount(), MemImplementingAllocator::getMeter(), MemPoolChunked::getStats(), getStats(), MemPoolChunked::idleTrigger(), MemPoolChunked::~MemPoolChunked(), and ~MemPoolMalloc(). Definition at line 270 of file Pool.h. 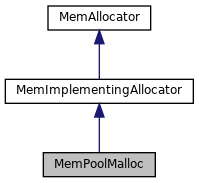 Referenced by MemImplementingAllocator::MemImplementingAllocator(), memPoolIterateNext(), and MemImplementingAllocator::~MemImplementingAllocator(). Definition at line 275 of file Pool.h. Referenced by allocate(), deallocate(), MemPoolChunked::get(), MemPoolChunked::getStats(), getStats(), MemChunk::MemChunk(), MemImplementingAllocator::objectSize(), MemPoolChunked::push(), and MemPoolChunked::setChunkSize(). Definition at line 274 of file Pool.h. Referenced by allocate(), and MemPoolChunked::get().